Please email Bill Denny @ cedarcitygunclub@gmail.com or call 405-3790 if you can help in any way during our Dove Season Tune-Up at the end of the month. There will be lots to do: Registering shooters, Reloading Clays, Pulling Clays for participants, station setup, cleanup, etc. Even if you can only be available for a few hours, please help support this event. Remember the event is between 9 and 3, but much to do before, during and after. Thanks! 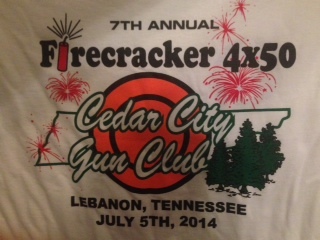 What a Great 7th Annual Firecracker 4x50! Truly Great weather, Great food, Great time, and Excellent Shooting! Click on the "Firecracker Shirt" to see all of the day's pictures!